Ideal for imaging diverse fluorophores in fixed and live samples. Suitable applications include colocalization studies, FRAP, FRET, spectral imaging, and time courses. Lasers: 405nm, argon (458, 488, 514nm), 561nm, 633nm. Objectives: 10x, 20x, 40x oil, 63x oil, 63x water, 100x oil. Features: 3 photomultiplier tubes (PMTs), one transmitted light PMT, manual x-y stage, Zen software. Analysis: An off-line workstation is available for imaging analysis. Faculty and students who wish to use the microscope should follow the instructions in the New Users Guide. Training takes ~2 to 3 hrs, with additional mandatory follow-up sessions required until the director determines the user is capable of operating the microscope independently. Users are encouraged to bring their own samples to the training session. If none are available, prepared slides will be used. It is also highly recommended to review the UMD Zeiss LSM710 Quick-Start Guide before training begins. The microscope is available to trained users on an equal basis. Individual users may reserve one four hour block of time during "peak" daytime hours, and an additional 6 "off-peak" hours (all other times). For a comprehensive list of policies (including BSL-2 protocols), please see the Facility SOP. The rate schedule applies to all users and is current for the 2018/2019 academic year. 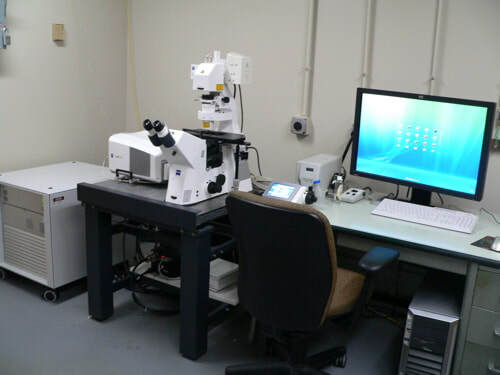 Fees are used to help cover the cost of the service contract on the microscope, which is partially subsidized by the department, and to help pay for materials such as lens paper, lens cleaning solution and mercury bulbs.